I volunteer at a charity shop. The inventory veers somewhere between 'boutique' and 'pedestrian'. Sometimes items from 'yesteryear' come into the shop that everyone seems to go ga-ga for, so they're usually not long for the sales floor. What seems to be in vogue are colorful pyrex bowls, chrome kitchen appliances--toasters, blenders, waffle irons--certain mid-century furniture pieces, and anything labeled Waterford crystal. We volunteers must adhere to the '3 hour rule'. That means that once an item has been priced and put out on the floor we must wait the requisite three hours before being able to purchase. If we were to buy any and all straight away, then what would be left for those who come in off the street hoping to find something wonderful? They'd be left with the dregs and we'd surely be on our way to going out of business. 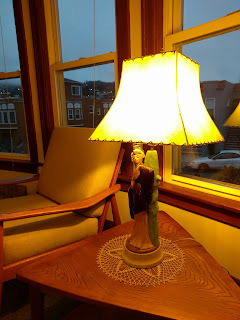 A few weeks ago, I happened to unpack a donation that included a kitschy lamp from, I believe, the '50s. The lamp features a stylized-looking Asian woman carrying a fan & wearing flowers in her hair. Her finger nails are even painted a dark red. There are a few cosmetic issues with the body, and the harp is a bit bent, but the shade, a lovely avocado green, is in fairly good nick. I thought for sure that she'd be out the door in no time. Boy, was I wrong! She languished in the window, being overlooked by all, until I decided today to rescue her from isolation. She brightens up the joint nicely. Don't you think? She is a heap of fun - and I am so glad she has found a home where she will be appreciated. Perfect kitsch. Here in Bath, there is an antique dealer who offers free appraisals for all donations, and in this way he is able to cream-off all the good stuff before anyone has seen it. I hate him, but I suppose I would only do the same myself if the workers were silly enough to allow me to. I love the lamp Bea. Three-hour rule, eh? How do you all survive?